Modica. A city of intense beauty, part souk, part Renaissance fantasy, a mosaic of buildings reflecting an equally diverse populace. 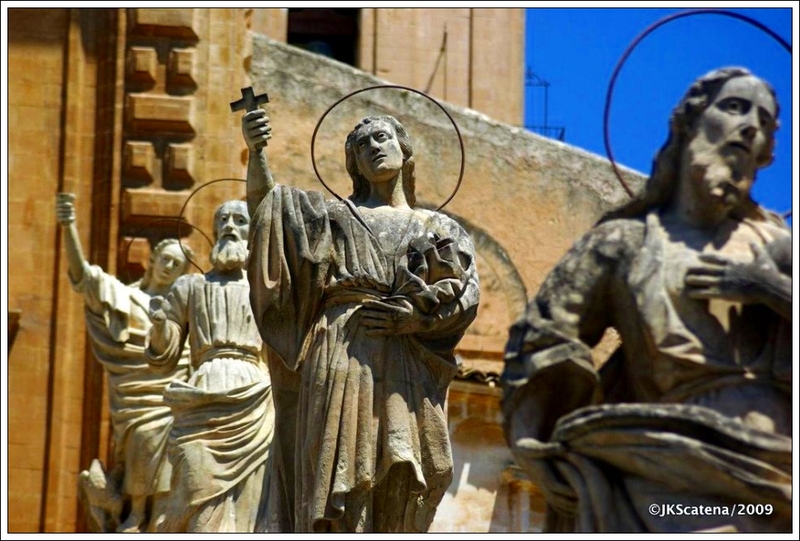 Over the course of many years of travel to Sicily, I have stayed in Modica numerous times. In this post I will share some of the little known treasures – and some well known – in a Sicilian city I have come to love. Some orientation will help you understanding the geography and cultural diversity of the city. Modica Basso is located in the center of Modica’s valley. Despite the destruction caused by the devastating earthquake in 1693 (which destroyed the greater part of eastern Sicily), the city has survived and restored its Sicilian Baroque splendor. Sicilian Baroque? This is a style of architecture established in this area of Sicily after the 1693 earthquake. Known for fantastic sculptures in the facades of buildings and churches, it has come to symbolize a unique style particular to this geographic area of the island. Until 1902, there were numerous bridges across the river Modicano, formed by two rivers called the Pozzo dei Pruni and the Janni Mauro. After a disastrous flood that same year, the city redirected the river through culverts beneath what is now called the Corso Umberto I, the city’s main thoroughfare. Shops abound along this road offering everything from jewelry to clothing to restaurants. Over the course of centuries, Modica Alta was established above the city’s valley. It is here that one of the most beautiful churches in Italy is located. (See “Churches” below). This is a residential area of the city offering few shopping options. The views, however, from the high point above the city are spectacular. The Cathedral of San Giorgio: Located on the steep hillside above the lower city, this is one of the most striking examples of Sicilian Baroque in Sicily. The facade was rebuilt after the earthquake of 1693, and the results are spectacular. One of the island’s first meridians, a means of tracing the seasons by the position of the sun on the floor of the cathedral, crosses in front of the main altar. It was in 1895, that the mathematician Armando Perinio received permission from the church to install the meridian. The rays of sunlight that pierces the high windows of the interior, particularly in the afternoon, create prisms of light on the surface of huge white interior marble column; an evocative sense of the spiritual in a spiritual place. The Cathedral of San Pietro: Older than San Giorgio, this was the diocesan church of the city until factions formed around Modica Alta and Modica Basso. The ensuing divisions ended in their being two patron saints of the city – San Giorgio for the upper city and Saint Peter for the lower city. The statues of the twelve saints that stand along both sides of the entrance stairway to the church are beautiful, as is the interior of this historic church. 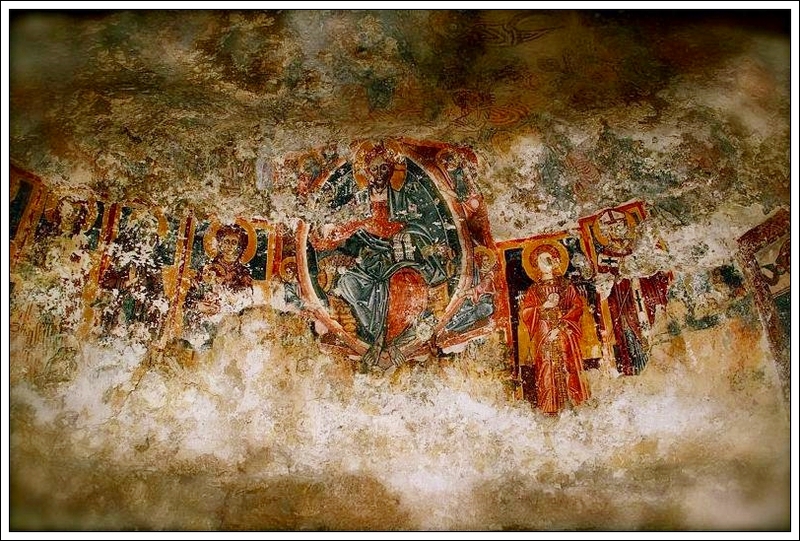 San Niccolo Inferiore: It was in the late 1960’s, when a car repair garage was being renovated, that the workers opened up a cave that had been used by early (4th Century A.D.) Christians as a place of worship. Located almost directly across the street from one of Italy’s premier chocolatiers (see Chocolate below), you have to ring a bell to enter this little known treasure in the heart of the city. Once you ring the bell, a warden leans out of a window above you, descends and opens the cave for you. The walls retain remnants of fourth and fifth century frescoes created by the artists of the day, gorgeous in their simplicity, moving in their beauty. 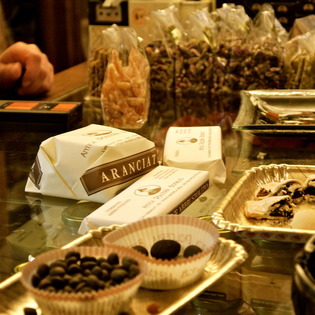 You can find few chocolatiers in Italy that can match the history of Bonajuto (bon-aye-u’-toe) in Modica Basso. Established in 1880 by Francesco Bonajuto, the recipes used in this workshop date to the time of Spanish occupation on the island. The grainy texture of the chocolate,(they do not allow the sugar to dissolve completely) mixed with ingredients as diverse as red pepper or lemon, are a delight. Guided visits are possible at Bonajuto. See below under “IF YOU GO” for further details. There are numerous options open to visitors who choose Modica as the base for their visit to this part of Sicily. 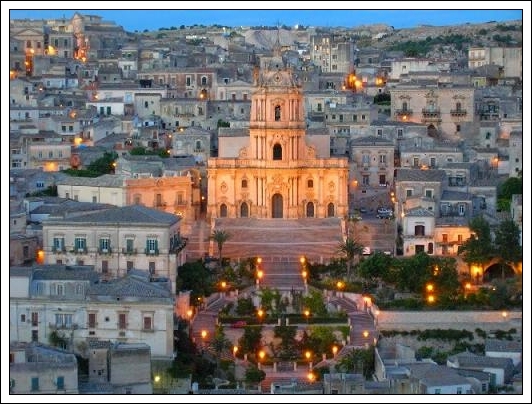 Easily reached are the other famous Sicilian baroque cities of Scicli, Noto and Ragusa. Lovely small fishing villages dot the southeastern coast and offer quiet (except in July and August!) respite from the cities. A longer day trip can take visitors to the extraordinary Valley of the Temples near the southern town of Agrigento. (A future post will discuss the Valley in great detail). On many evenings, I have walked up to the piazza above the Hotel Palazzo Failla – see “Hotels” below (not for the feint of heart!) and looked out over the valley of Modica. Despite the occasional group of local youths who gather as young people are wont to do, the timelessness of the buildings, the rugged beauty of the architecture and the long sifted light of sunset evoke a different time, a different era, a different Italy. 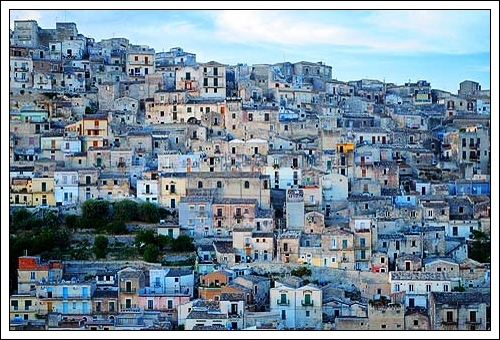 No matter where your travels take you during time in Sicily, visit Modica. You will not be disappointed. Absolutely and without question, the Palazzo Failla in Modica Alta. 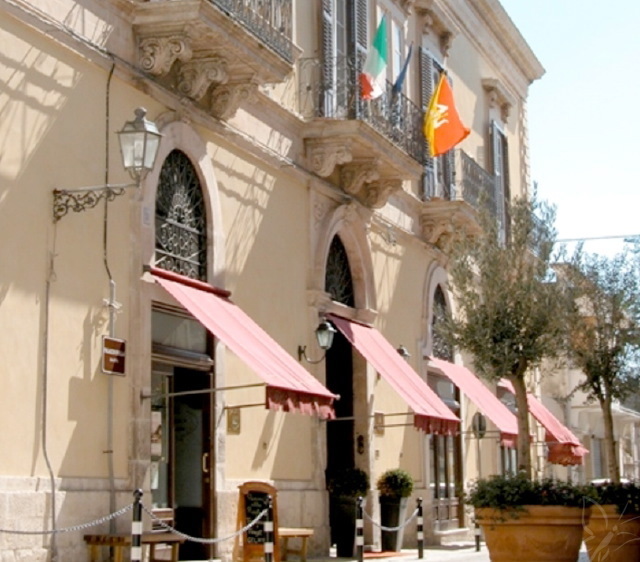 The Failla family opened this lovely hotel in their family palazzo. The resultant restoration is gorgeous; the master bedroom, replete with original floor tiles from the Sicilian ceramic city of Caltagirone, are one of the many options for guests. In 2008, the family opened a dependance across the road from the original hotel where suites that include every modern convenience (Spa tubs, steam showers for example) are available. There are two restaurants in the hotel – the Gazza Ladra and La Locanda del Colonnello. The Gazza is one of the finest restaurants in Italy and the Locanda offers more typical Sicilian fare. Both are excellent places to eat in the city. In closing I must write that the Failla family has cared for many of my company’s clients over the years. Their extraordinary service would be difficult to match in the highest luxury level hotels across Italy. Truly a wonderful place to stay during your explorations of southern Sicily. Osteria dei Sapori Perduti. This is a treasure of a place to enjoy a fabulous meal in Sicily. The recipes are generations old, traditional in every sense. The translation of the Osteria’s name (The Osteria of Lost Flavors) is not quite accurate as the flavors, rediscovered in traditional recipes, are unforgettable. This is a very affordable place and the service is matched by the owner’s dedication to satisfying even the most discriminating palate. Pizzeria Smile? Yes. 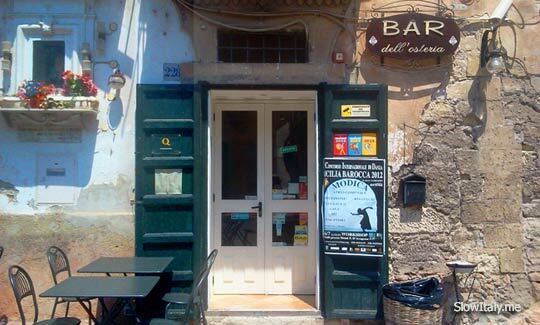 A short walk from the Palazzo Failla in Modica Alta is this wonderful pizzeria. After long days of travel and visiting across this part of Sicily, the pizzeria offers simple and flavorful fare served in a very plain atmosphere. Weather permitting, the dining rooms open to the street and absent the occasional motos that rip past the restaurant, the cool evening breezes are a welcome respite from the heat of summer and welcome cool in the autumn and spring. San Giorgio and San Pietro: 10:00AM until 6:00PM except Sundays. Sunday 1:00PM – 5:00PM. The schedule for masses are posted on the doors and interior entrances to the churches. San Niccolo Inferiore: Via Rimaldi, 1. Tel: +39.331.740.3045. Hours vary by request. You must ring the bell at the entrance to the site to gain entrance with no reservation. If you wish to set up a time to visit, call the Italian cell phone listed in this summary and make an appointment. This is a place with no formal hours, absent 10:00AM to 5:00PM. It is catch as catch can, but well worth the effort!